CALGARY, Alberta (AP) — Johnny Gaudreau got his first home hat trick and the last-place Calgary Flames kept giving fans at the Scotiabank Saddledome reason to cheer. 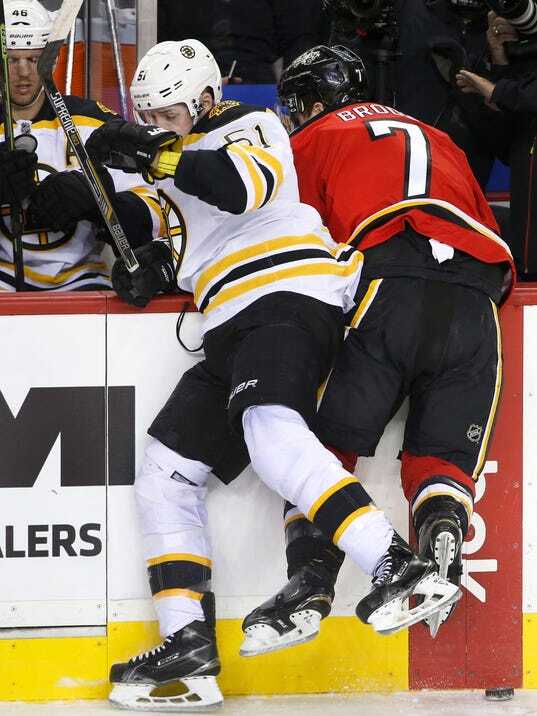 Gaudreau finished his second-career hat trick in overtime after Jiri Hudler tied the game with 1.2 seconds left and the Flames beat the Boston Bruins 5-4 on Friday night for their sixth straight home victory. Gaudreau trailed a 2-on-1 rush and took a pass from former Bruin Dougie Hamilton in the high slot. He stickhandled in on Tuukka Rask and beat the goaltender with a low shot. “Last year I was fortunate enough to get a hat trick but it was in a different arena. I was fortunate to get one tonight. It’s always exciting seeing hats get thrown on the ice,” Gaudreau said. It was quite a night for Gaudreau, a Boston College product who won the Hobey Baker Award during a three-year stint in Massachusetts. He also had an assist for his first four-point game in the NHL. His only other hat trick was Dec. 22 last year against the Kings.